Enter for your chance to win a printer and one year of toner! Office printing ranks as a top-four business expense for most companies. These costs can quickly add up – especially for small businesses. But, by entering Cartridge World’s National Small Business Week contest, one lucky business can eliminate these costs by winning a free printer and free ink or toner for a year! Eligible businesses can enter to win by filling out the entry form explaining why their business printing is inefficient or could be improved. One business will receive one free printer and one year’s worth of free ink or toner. (Approx. retail value of the prize is $1,200). 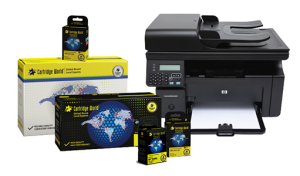 Cartridge World will choose one winner from across the country (one entry per business allowed) and award them with the prize of a free printer and a year’s supply of ink or toner cartridges. Entries will be judged on the explanation of why your business printing is inefficient or could be improved. Terms & conditions for details.